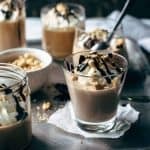 Are you looking for the best Caramel Chocolate Panna Cotta recipe? Congrats, you’ve found it! Creamy chocolate Panna Cotta and caramel Panna Cotta in one divine dessert. Good news, guys. Panna Cotta is super easy to make. 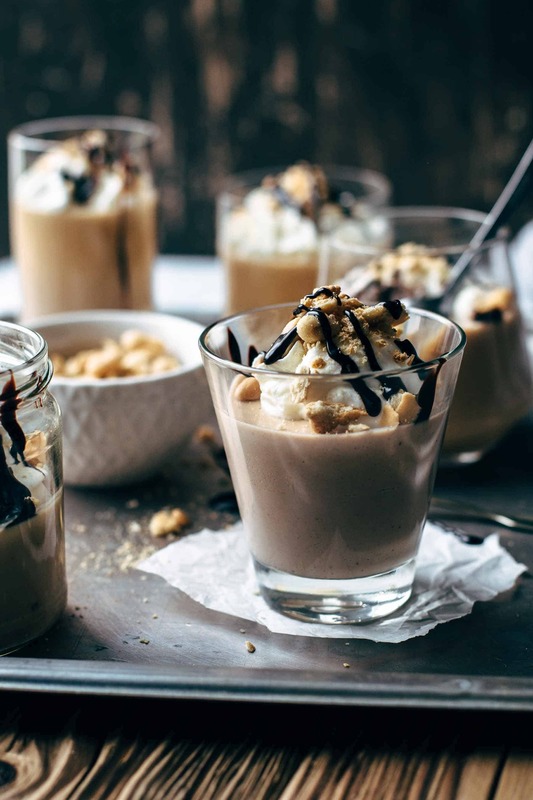 To make this Caramel Chocolate Panna Cotta recipe you just need 20 minutes time in total and 8 ingredients. Panna Cotta is an Italian dessert, and its texture is like pudding. This means that we have an Italian dessert that is like chocolate and caramel pudding and takes you a very short time and is super easy to make? I think you already got hooked. Because I couldn’t decide between chocolate Panna Cotta and caramel Panna Cotta, I’ve decided to make both because I didn’t just want to have the chocolate or the caramel flavor in the Panna Cotta and the other flavor through syrup. Let’s start with the chocolate Panna Cotta first. Add gelatine and milk in a little bowl and let bloom for about 5-10 minutes. In the meantime, you can go on with the other steps. 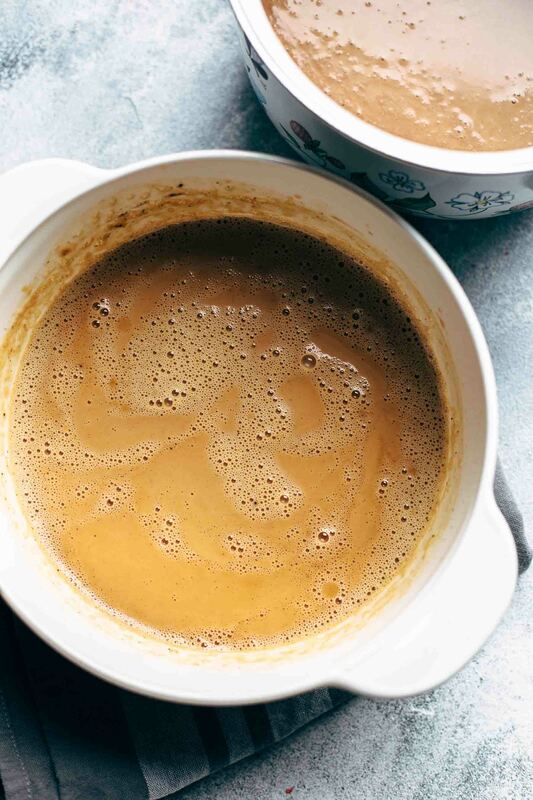 Bring heavy whipping cream and sugar to a boil. Immediately, when it starts reaching a boil, stir in grated chocolate until the chocolate is completely dissolved and remove from the heat. After removing from heat, stir in vanilla and bloomed gelatine. I grated high-quality dark chocolate. Take the brand you love the most because the taste and the quality of the chocolate has a huge impact on the Panna Cotta flavor. You can also substitute with unsweetened cocoa powder if desired. If you just want to make chocolate Panna Cotta, this is the point where you are done and could fill it into jars. The caramel Panna Cotta is very similar to make like the chocolate Panna Cotta though there are a few differences. Start again with blooming the gelatine. Then heat up the heavy whipping cream in the microwave until it’s hot but not boiling. I tell you later then, why it is important to do this. In a medium saucepan, cook sugar with water until it is completely dissolved and has a dark amber color. Don’t stir the sugar just slew it a few times off the heat that the sugar doesn’t burn. Now, slowly add the warm cream. If you add cold cream, you will end the cooking process of the sugar. Whisk continuously and bring to a boil. Remove from heat and stir in vanilla, salt, and bloomed gelatine. If you just want to have caramel Panna Cotta without chocolate Panna Cotta, pour into jars and let chill until firm. You can make both Panna Cotta’s as I did or just make the one you prefer, chocolate or caramel. I poured both at the same time one after another into jars because I wanted that the flavors mix up to have the chocolate and the caramel Panna Cotta a bit swirled. If you want to have them separated in two layers, start with one and pour into jars. Then chill until it gets firm and then make the second Panna Cotta and pour it on top. It’s up to your preference. 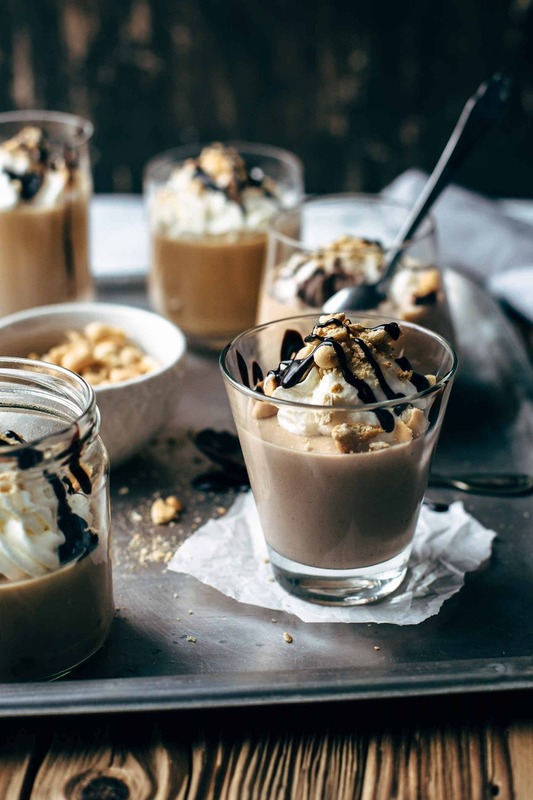 If you make this Caramel Chocolate Panna Cotta recipe, leave a comment, rate it and tag a photo #alsothecrumbsplease on Instagram! Would love to see your snap! 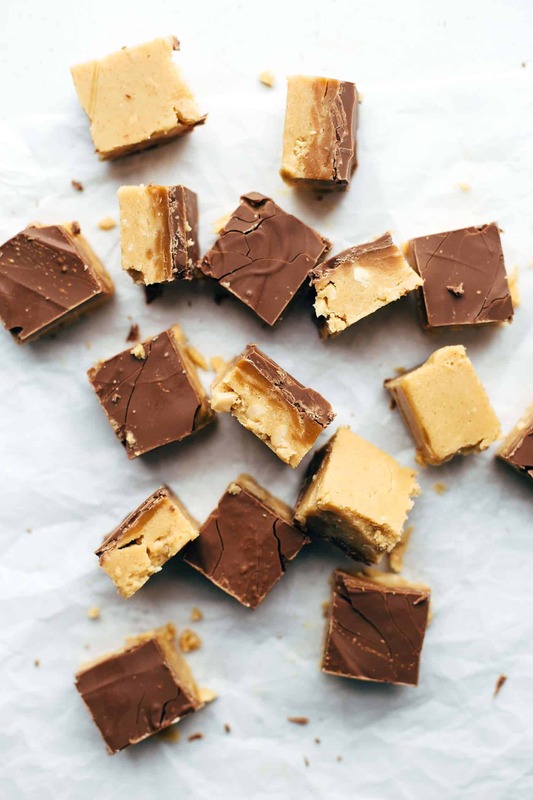 You may also like The Best and Softest Caramel Snickerdoodles + VIDEO, No-Cook Snickers Peanut Butter Fudge, or click here to see all things sweet. 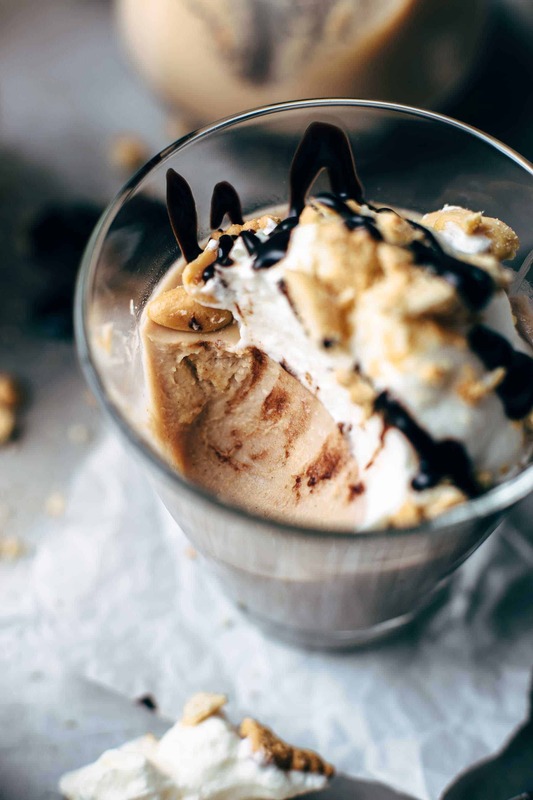 Are you looking for the best Caramel Chocolate Panna Cotta recipe? Congrats, you've found it! Creamy chocolate Panna Cotta and caramel Panna Cotta in one divine dessert. Chocolate Panna Cotta: In a small bowl combine gelatine and milk and let stand for 5-10 minutes. Meanwhile, in a medium saucepan over medium-high heat, bring heavy whipping cream and sugar to a boil. Once it reached a boil, stir in grated dark chocolate and stir until the chocolate is melted. Immediately remove from heat and stir in vanilla* and bloomed gelatine until combined and smooth. Set aside. Caramel Panna Cotta: In a small bowl combine gelatine and milk and let stand for 5-10 minutes. Microwave heavy whipping cream in a heat-proof bowl for about 1-2 minutes until it is hot but not boiling. Meanwhile, in a medium saucepan over medium-high heat, bring sugar and water to a boil. Cook until sugar is completely dissolved and has a dark amber color. Don't stir the sugar just slew it a few times off the heat to prevent the sugar from burning. Slowly add warmed cream stirring continuously and bring to a boil. Once it reached a boil, immediately remove from heat and stir in vanilla*, salt, and bloomed gelatine until combined and smooth. Alternately pour chocolate and caramel Panna Cotta into jars. 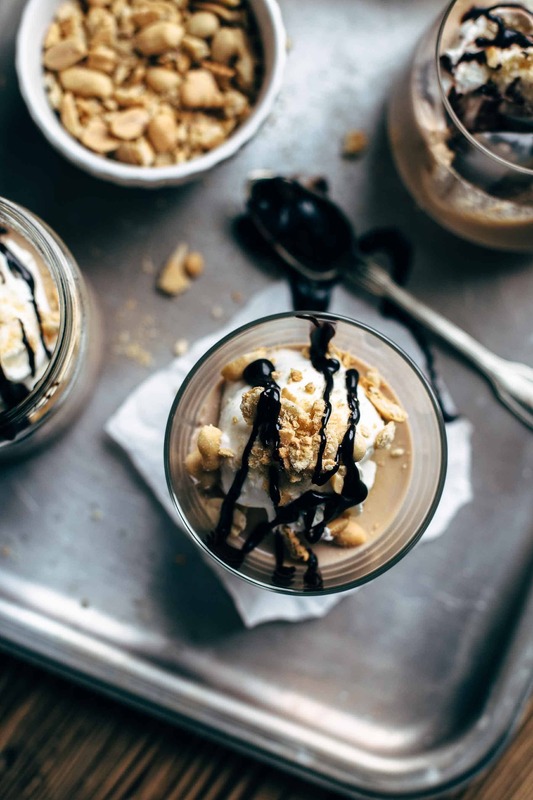 The chocolate and the caramel will mix up in the jars, but this is totally ok. 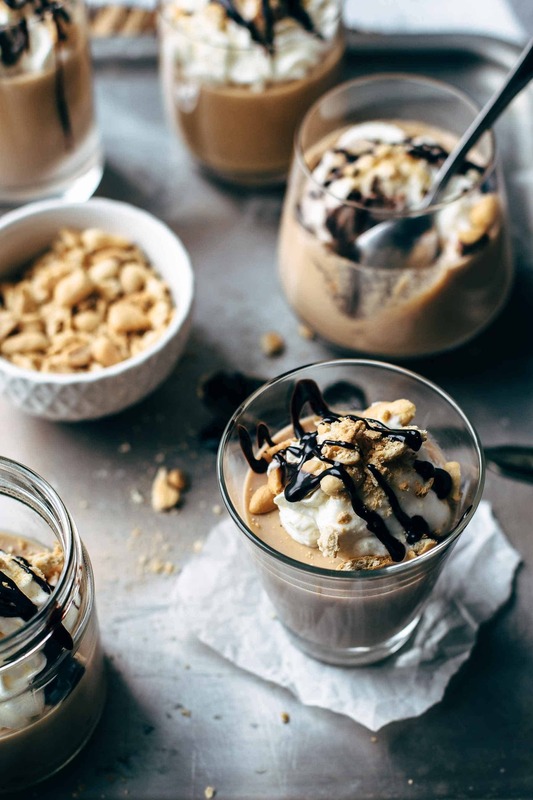 If you want to have two separated layers of chocolate and caramel Panna Cotta, start with one, pour into jars, chill until it starts to get firm, and then make the second and pour on top. Chill in the fridge at least 4 hours or until firm. Keep leftovers in the refrigerator up to 2 days. Thank you so much, Mon! Enjoy it and let me know what you think. Have a great day! For the gelatin do I use already made gelatin or a powder? I used gelatin powder for this recipe.